A Phase 3, Multicenter, Sham-Controlled, Randomized, Double-Masked Study Assessing the Efficacy and Safety of Intravitreal Injections of 440 �g DE-109 for the Treatment of Active, Non-Infectious Uveitis of the Posterior Segment of the Eye. A phase 3, open-label safety study of suprachoroidal triamcinolone acetonide injectable suspension in patients with non-infectious uveitis. A phase 2, 6 month, randomized, masked, multicenter study to assess the safety and efficacy of CLS-TA, Triamcinolone Acetonide Injectable Suspension in the treatment of subjects with macular edema following uveitis. Phase 3 study of the efficacy and safety of voclosporin for non-infectious uveitis. A multicenter, non-interventional extension study of the safety and efficacy of CLS-TA for the treatment of macular edema associated with non-infectious uveitis. A 6 month, phase 3, randomized, masked, controlled clinical trial to study the safety and efficacy and safety of Triamcinolone Acetonide Injectable Suspension (CLS-TA) for the treatment of subjects with Macular Edema associated with Non-Infectious Uveitis. A 2 year Phase 3 active treatment controlled study assessing the efficacy and safety of Sirolimus for the treatment of non-infectious uveitis. A 6 month Prospective study of the Dexamethasone Intravitreal Implant (Ozurdex) for Uveitic Macular Edema. 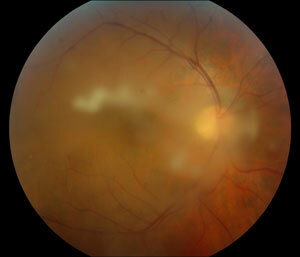 The use of a sustained-release ganciclovir implant to treat Cytomegalovirus Retinitis.